There is a certain expectation when going to see a sequel: it should have many of the same characters and the storyline should be an extension of the original. 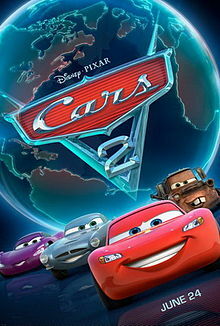 Cars 2 meets the first but only partially in terms of the story: the fact Lighting McQueen is invited to participate in the first-ever World Grand Prix of Racing fits in nicely but then there is a significant (and from my point of view unnecessary) departure from expectations: he and his friends become entangled in international espionage led by a group using a secret weapon to destroy cars running on a new sort of fuel. I did go there to see a James Bond movie complete with all kinds of gadgets and weird looking guns firing incessantly. Consequently the racing aspect loses out to these too frequent and repetitive “battles” making the movie too long at almost two hours. And I’m sure for most viewers the espionage serves only to complicate matters. On a more positive note the site of the races (Tokyo, the Riviera, Rome and London) are beautifully rendered highlighting the unique features that set them apart as tourist destinations.